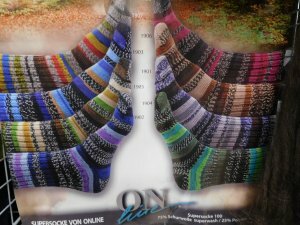 This 75% wool-25% nylon sock yarn is the latest pattern from Online. I've been wearing a pair of wool-nylon socks from the Online Supersocke line of yarns for 8 years now, thru lots of washings and dryings, and they still have no signs of wear! And I mean....not a thread bare or even starting to bare...not in the toes or the heels, even! There is a cotton Supersocke available as well here.